Description - The western screech-owl is a small owl that is generally an overall grey although some birds in the humid, coastal, northwest are brownish. The underparts are marked with blackish streaks and thinner bars. It has yellow eyes, a dark bill and ear tufts when the head is raised. The voice is a series of hollow whistles on one pitch, separated at first then running into a "bouncing ball" series of low whistles. Distribution - The western screech-owl is resident from Alaska south through British Columbia into Mexico and east to the U.S. Rockies. The inhabit woodlands, orchards and yards with many trees. 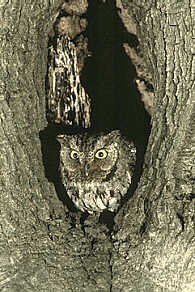 Biology - Western screech-owls feed on mice and meadow moles whose populations fluctuate greatly. Therefore they only incubate one egg at a time to ensure that the youngster will have plenty of food. Thus the eggs hatch in sequence and the young vary widely in size and age. The nest is a natural cavity, a woodpecker's hole or a man-made nest box.